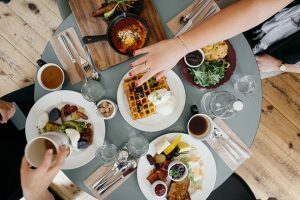 We all love indulging ourselves with heavy meals once in a while, whether we are celebrating an event or trying to cope with recent situations. No matter the case, even though our brains release endorphins to make us feel happier, our digestive systems will be probably caught off guard. So, next time you’re thinking about that juicy burger and fries combo or having another slice of that delicious pepperoni pizza, worry about your digestion too. Heavy digestion will not only make your stomach bloat but will also make you feel heavier and lose energy. Here are some tips to prevent that. We all live hectic lives, and we sometimes skip at least one meal to finish work faster. Unfortunately, this millennial habit is bad for your health, causing digestive problems. Eating just one meal a day won’t only determine you to gain weight in time but will also mean more time for your stomach to digest all the food. 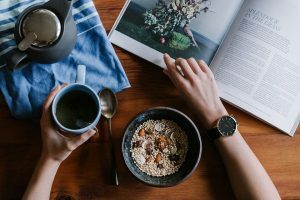 Having a strict schedule with three main meals and two snacks will guarantee the optimum level of energy throughout the day, will help you stay focused, and will provide enough time for your stomach to digest food in-between properly. Eating is a social habit in most cultures, helping people to know each other better and spend quality time together. So, whether it’s with your family for breakfast or dinner or with co-workers at lunch, don’t forget to share your food with your loved ones. Since up to 80% of our body is made of water, it comes as no surprise that the lack of proper hydration causes plenty of health problems. Depending on your weight, age, and type of lifestyle, you should drink between 50 and 100 fluid ounces of water daily. The lack of water in the organism will not only make your digestion heavier but can also lead to headaches, lack of focus, dizziness, nausea or tiredness. Being a night owl also means that your brain won’t have enough time to rest during the night. Therefore, it will require more water to function properly. For smooth digestion, we suggest drinking one glass of mild water with lemon juice in the morning as well as one glass of water before every important meal. Don’t drink water while you’re eating as water and food have different digestion times. Exercising has a lot of health benefits. It can help reduce stress and anxiety, tone your body, increase your endurance, and even have benefits on your skin or digestive system. Regular workouts can prevent constipation by decreasing the amount of time your food spends in the large intestine. Mild workout routines like cardio, swimming or jogging will stimulate the natural contractions of all muscle groups in your body, allowing food to be eliminated faster. However, it is best to wait for one hour after each important meal before exercising to allow enough time for your food to settle. The best time of the day for exercising is after you wake up in the morning and before having breakfast. You won’t have any food in your stomach that will make you feel heavier or bloated. Another way to ensure a healthy digestive system is to add more fibers in your daily diet. Fiber-rich foods will help digestion and will prevent constipation while also maintaining the general health of the bowel. Fibers can also help reduce bloating, gas or diarrhea. Some of the most common sources of fibers include veggies, fruits, legumes, whole-grain products, seeds, and nuts. There are plenty of delicious ways to introduce these foods into your daily diet. For instance, with the help of a garlic press, some garlic cloves and one tomato, you can easily prepare a tasty salsa that will season your potatoes, meat or fish. A glass of smoothie made with fresh fruits and seed powder will provide enough energy to help you get through the morning. And, if you’re not lactose-intolerant, eating yogurt once a day will also benefit your digestive system. It contains essential bacteria cultures and natural probiotics that will fight against certain health problems, including the irritable bowel syndrome.